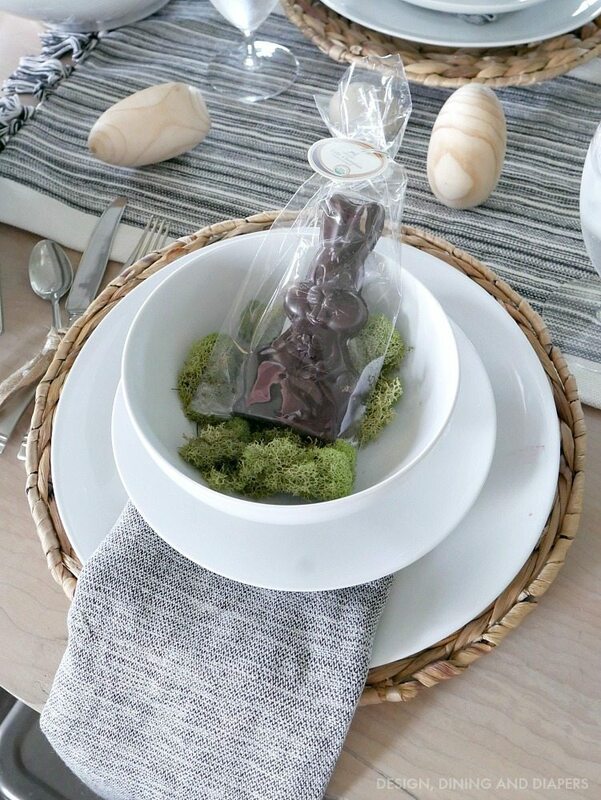 Yesterday, I shared some of my Easy Easter Dinner Ideas and Tips and today I wanted to give you a closer look at my Neutral Easter Tablescape. 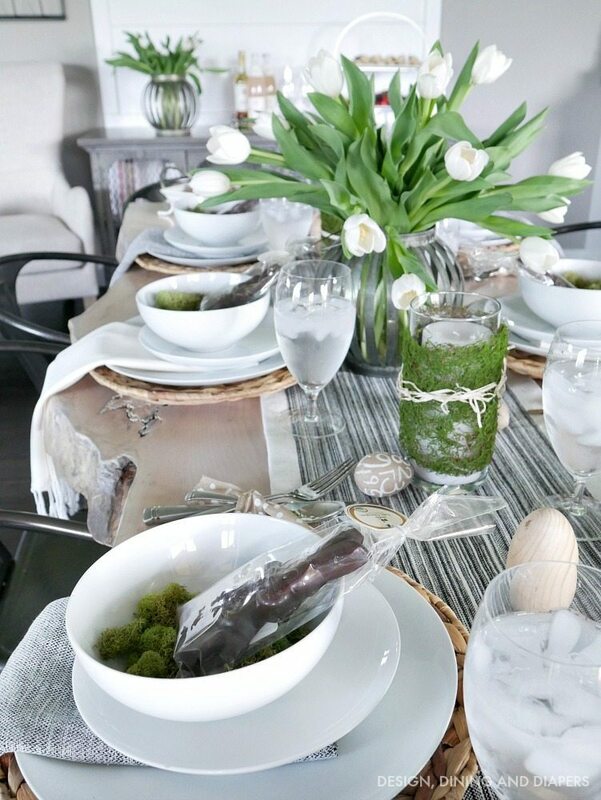 While I’ve been known to add a little bit of pink here and there during the spring and summer months, I typically decorate in all neutrals and let all my fresh food and greenery bring pops of color to the table. So let’s take a closer look at all the details. 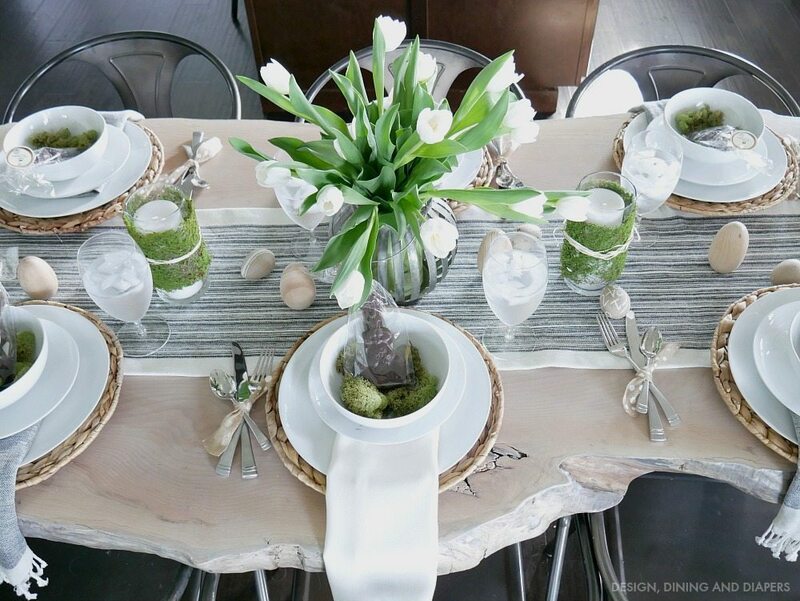 Have a big centerpiece will create a nice focal point for your table. 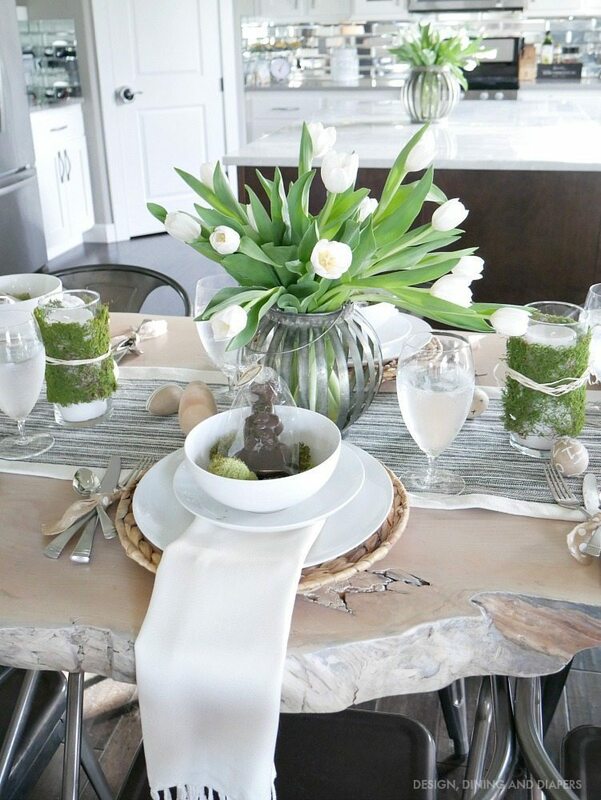 Tulips are generally inexpensive and create a beautiful full look to the table. 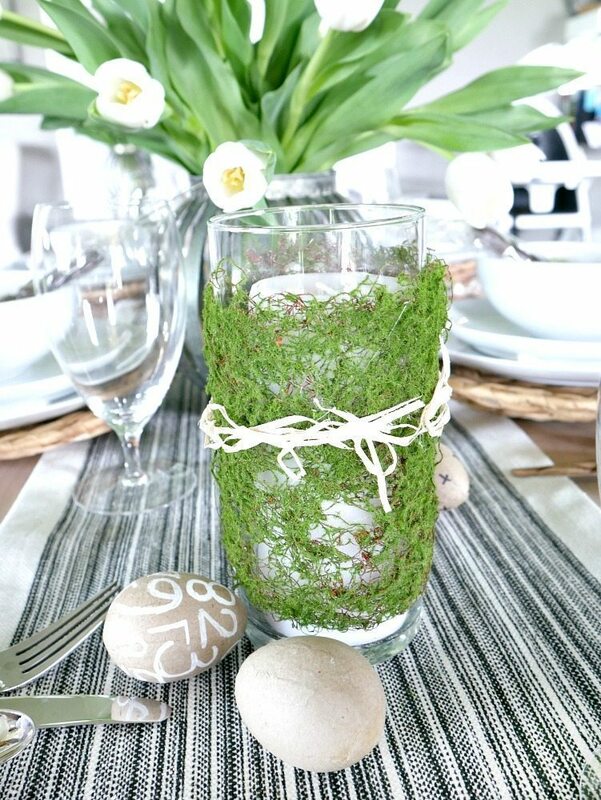 I added a nice black and white woven table runner, my moss wrapped candle holders and a few wooden eggs. Proof that you don’t always need tons of decor on your table to make it look festive. 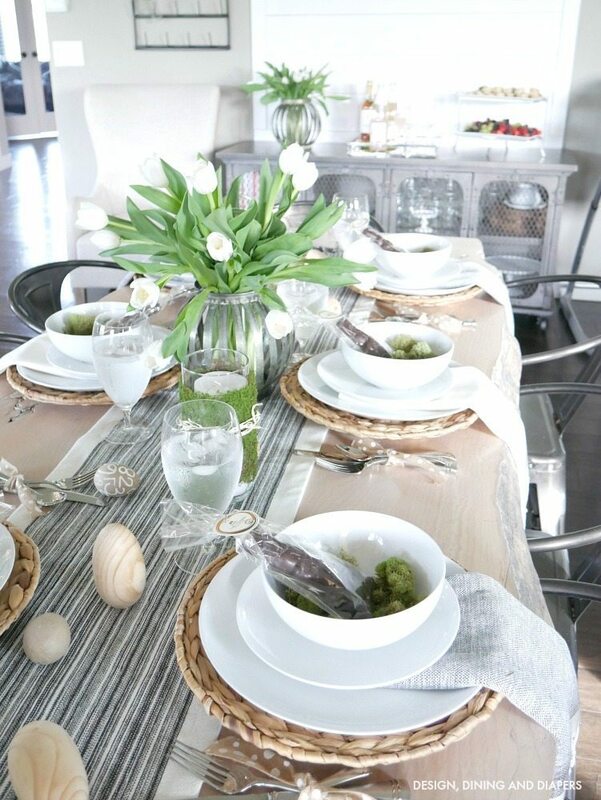 For each place setting, I used wicker charger which always bring a very warm weather vibe to the table. I love using these for spring and summer! 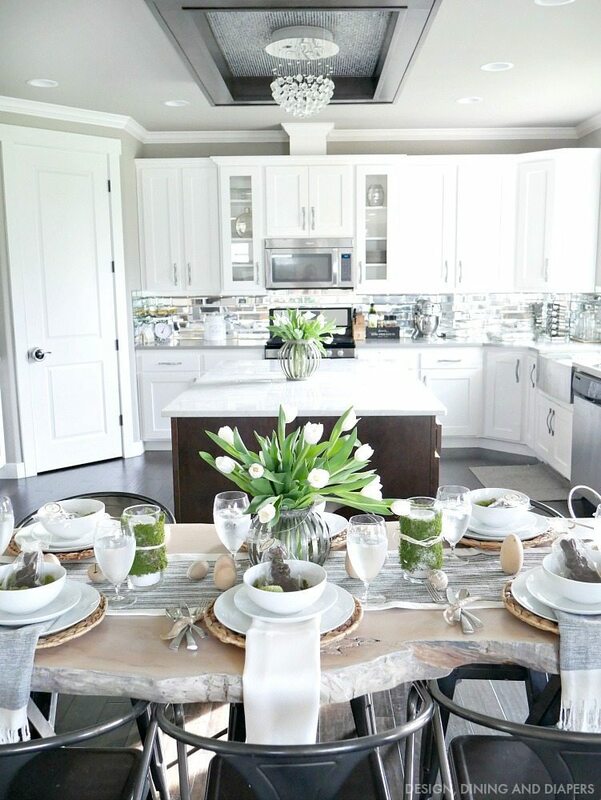 Then, added all white dishes for a very crisp and clean look. 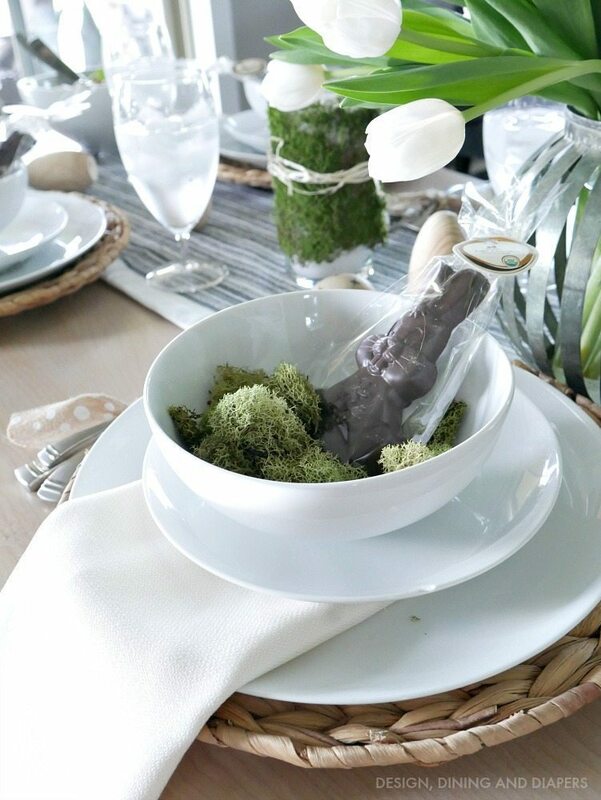 I love making each place setting feel special, so I added a little moss to the bowls along with a delicious chocolate bunny that can be used as a favor for each guest. Here is a closer look at my DIY candle holders, you can learn how to make those here. If you are curious about the metal vases used with the tulips, they are actually metal lanterns I found at Michaels, then I placed a glass cylinder vase in them and turned them into beautiful displays. I’ve recently become a huge fan of these Turkish Towels, I found these on Amazon and have really enjoyed using them as napkins. They are sooooo soft and I love the texture that they add. Hope you all have a wonderful Easter! Have so much fun decorating your table and enjoying this special holiday with family and friends. Beautiful table and quite interesting table top. Hadn’t seen one of those for long time. Living in Seattle you are able to find so many better resources for decorating. Sometimes I miss San Diego for all the wonderful stores. When we were there last Summer got to go to an IKEA and Home Goods for first time. S.D.. didn’t open many of stores til after we moved to MT. in 1992. Hadn’t been back to S.D. since we left. Our oldest son bought a house about mile away from where we used to live in East County. You have dressed your table in such a lovely way, choc. bunnies in bowls with moss is cute idea. Always enjoy seeing what you’ll come up with. Wishing you a wonderful Happy Easter.